In the 2014 code, this one sentence has been revised to be several paragraphs long with different scenarios. However the philosophy holds true, and once you understand the philosophy of the simpler 2011 version of 705.12(D)(2) you will be able to understand NEC 2014's more sophisticated version. 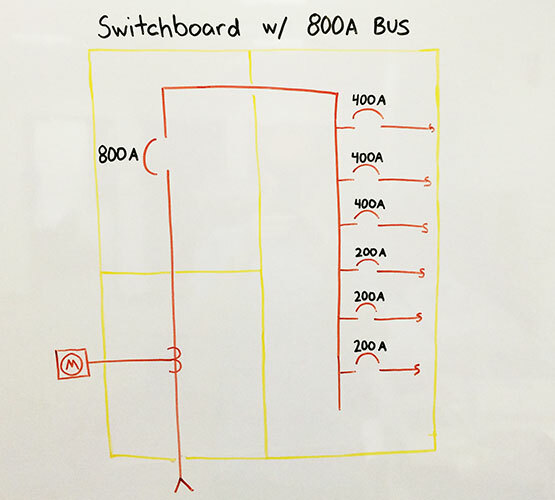 Below is a depiction of a typical commercial switchboard. It is very common for the sum of the branch circuit breakers to add up to more than the main circuit breaker. The engineer that originally designed the building and electrical system understood that the loads were intermittent, and very unlikely to be maxed out at the same time. This shows the system under a typical load. None of the branch breakers are pulling the full load, and the total current is less than the bus and main circuit breaker rating. Everything is perfectly fine in this scenario. 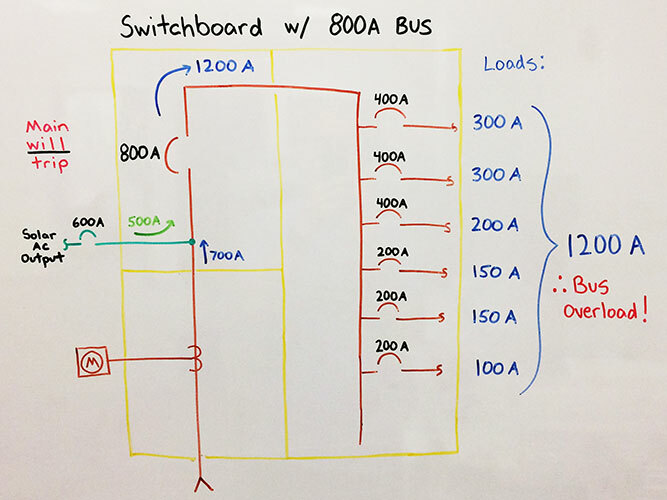 If the branch breakers draw more current than the main breaker’s rating, the main will trip and protect the bus. System under overload condition with solar interconnected load-side. 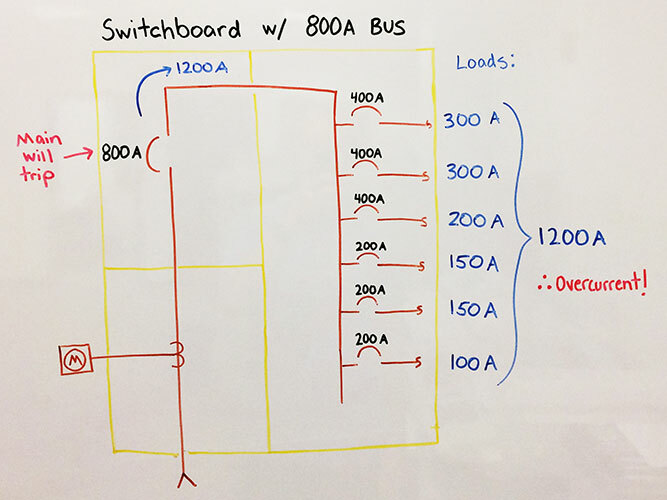 The load breakers are drawing more current than the main breaker’s rating, however the main is not tripping to protect the bus. The solar is acting like a "backdoor", allowing additional current to feed the loads. 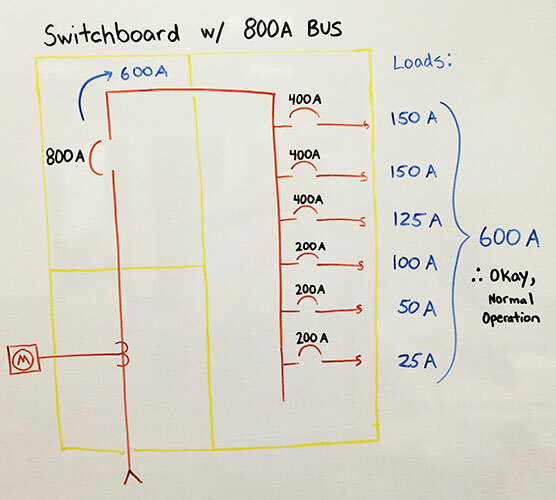 The loads are able to pull much more current than the bus is rated for, but the main breaker doesn't "see" it. The bus will overload, overheat, and fail (possibly catastrophically). This is what the 120% rule is protecting against! 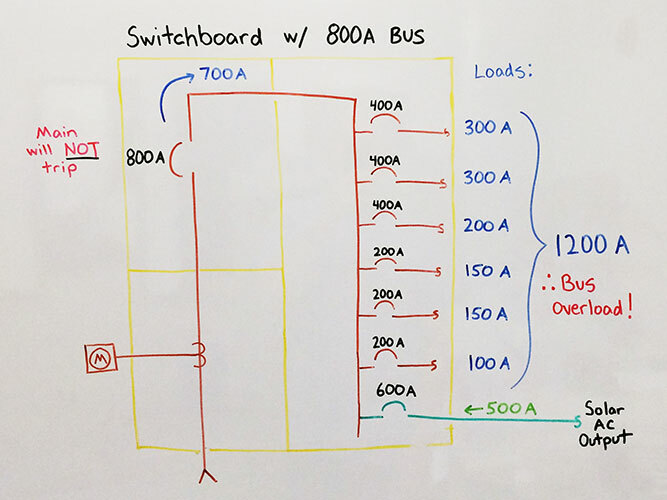 How does a line (supply) side interconnection affect the overload scenario? Below is the example with the same load. Since the solar is on the line side of the main, it cant sneak anything past it to the distribution section. It doesn't matter if the current is coming from the PV or the Utility, if it exceeds 800A the main breaker will trip to protect the bus. The main circuit breaker will continue to protect the switchboard just as it always has, nothing to worry about. Real life examples are not always as cut and dry as the example above. You can have cold sequence metering, tapered buses, interconnecting at subpanels, etc, things can get very tricky. As long as you apply the philosophy above to the new language in NEC 2014, you can work through the problem and ensure a load side interconnection cant overload the bus.